What is the Supplier Engagement Tool (YPO)? An online tool YPO members can use to focus engagement with their suppliers. It is designed to help everyone better understand and demonstrate social value. 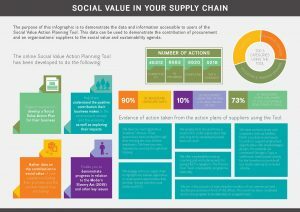 Suppliers use the tool to generate a free Social Value Action Plan for their business. This will help them to explore their impacts and identify practical ways they can make a positive contribution. YPO Members use information generated by suppliers engaging with the Tool. This will help them embed social value in their procurement processes and demonstrate a response to the Social Value Act. This is not a calculator tool. Suppliers are not asked questions to enable us to convert their activity into a financial ‘value’. We want to encourage Social Value to be considered holistically. Training teams to deploy the tool with suppliers will provide an opportunity for them to think about what Social Value means in their context and develop a narrative that makes sense.